Yesterday I basically finished up on all the the electrical wiring that had to be done. 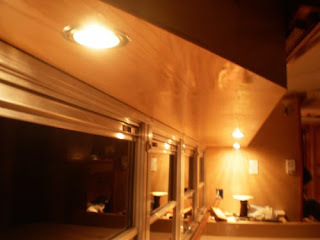 After that was done we decided that we needed more lighting added over where the kitchen table would be. Lucky for me I just happen to have a spare wire that I had ran earlier in the project that I never used. So I tapped into that and installed the lights. They turned out great! I still have to install the switch. 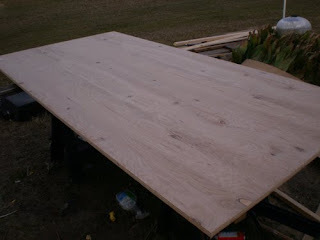 Today we went and picked up a sheet of 3/4" oak plywood for the dinning table and some 3/4" 1 x 3 for building the cabinet doors. 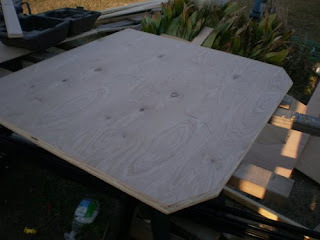 Lowe's gave me the plywood half off for only $20 because it had a few flaws. I took the measurements and made the cut. 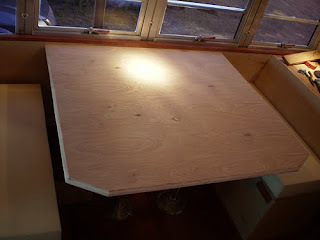 After making sure it was a good fit I used a router to rout the edges of the table. Here it is sitting in place. It is just temporarily here just to see how it looks. I will pull it back out to stain and varnish it. 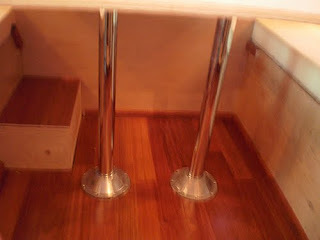 Here are the legs, again, just sitting in place.